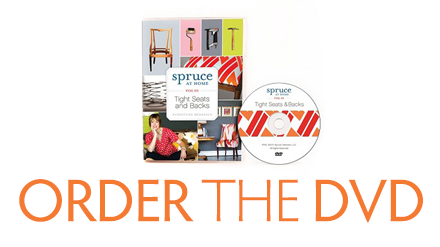 Amanda gives you a preview of Spruce’s first instructional DVD featuring step-by-step instructions for spring tying and upholstering tight seats and backs. Watch this sneak peek from Spruce’s first upholstery video to see how Amanda strips off old padding and fabric to get furniture ready to reupholster. Spruce Upholstery Tip #1: Take a lesson from Amanda on numbering your dining chairs so the seats and frames connect easily when the project is complete. Spruce Upholstery Tip #2: Take a lesson from Meredith on mixing multiple fabrics on one piece of furniture to save on cost and add design interest. Spruce Upholstery Tip #3: Which Sprucette can thread her sewing machine the fastest? Amanda and Clar go head to head in the Great Thread Off of 2011. But Clar has a tip or two up her sleeve. Spruce Upholstery Book Trailer: Take a look at our amazing new book and learn some of the fundamental basics of upholstery and design.